In our Instagram feed, we sometimes share RTW (ready-to-wear) looks that we come across that would be easy to recreate with Blank Slate Patterns. I love this slight variation of the Tulip Top pattern! Just incorporate a few changes in order to replicate this. Be sure that when you extend the left side edge, you trace it exactly the same as the right side. They aren’t straight lines, so this will ensure they align when you layer them. Trace the side down as far down as you want, then curve to blend with the hemline. For the bottom edges, simply hem (rather than bind as in the pattern). For the topstitching along the raglan seams, you can accomplish this a couple of different ways. You could sew these seams by flatlocking them, or you could just topstitch with a zigzag. 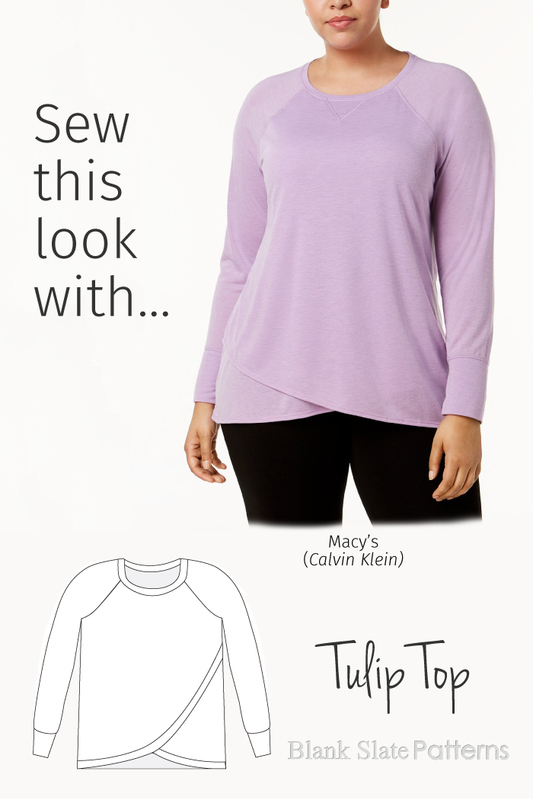 Sew the V at the center front neckline by marking with a washable marker then zigzagging.